There’s a palpable loathing for the 1986 film Big Trouble, mainly because it was John Cassavetes’ last and worst film, a bad combination for a man revered as a god by the stringent hipster crowd that film criticism seems to court with saddening regularity. How Cassavetes even became involved in Big Trouble is a question as yet not fully answered. American National Biography states that Cassavetes only stepped in to replace first director Andrew Bergman as a favor to the producer; Independent Film Distribution states he replaced not Bergman but Elaine May; Hollywood Incoherent claims he only did the film for the money. Accidental Genius and Guide to American Cinema claim he didn’t even direct the film at all, but was saddled unfairly with the credit. The abundance of tales told about Cassavetes’ involvement is likely a symptom of fans being upset that their hero’s last film wasn’t a stunning end to his career, but it’s also the product of the initial 1986 impression coloring every subsequent mention of the film. The idea that this movie is worthless is repeated by those who, for whatever reason, don’t want to take the time to re-evaluate the film. I held off writing about Big Trouble initially so I could submit it as my White Elephant Blogathon selection. It was reviewed, of a sort, over at United Provinces of Ivanlandia, where the illustrations are mostly unrelated Penthouse-type nudes and semi-nudes. I don’t know why. Maybe because many people consider Big Trouble a nonentity, so Ivanlandia felt he must fill the void with fake breasts and hair extensions. The film fails to be funny in several key instances, which is a bit of a problem for a comedy. The ever-stupid Onion A.V. Club blames the lack of the funny on John Cassavetes because he is inherently unfunny. This is where I point out that the A.V. Club reviewer also says he has not seen the 1979 In-Laws because “I don’t want it to taint my treasured memories of the 2003 remake with Ryan Reynolds.” Sure, we can assume he’s joking, but what kind of human does someone have to be to put “Ryan Reynolds” and “treasured memories” in the same sentence? A sadist, that’s who. I’m not saying Big Trouble is a classic, because it’s not; however, it’s not a film completely without redeeming qualities. It’s a farce centering around con artist Steve Rickey’s plan to scam a few million from faking his own death. 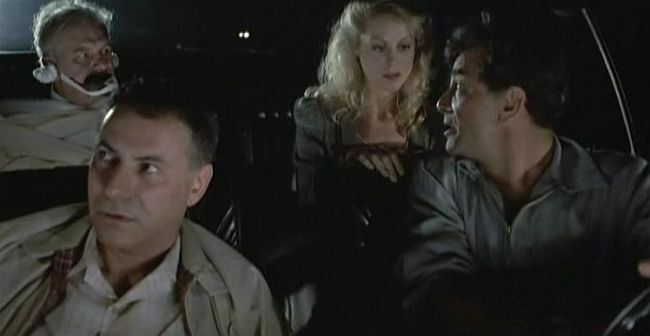 Many reviewers claim that Big Trouble is ripped off from Double Indemnity apparently without realizing that’s the joke: The entire scheme cooked up by Steve (Peter Falk) was bluntly lifted directly from the well-known Double Indemnity, and poor stupid Leonard (Alan Arkin) seems more stupid by an order of magnitude to have fallen for it in the first place. The funniest bit in the Double Indemnity homage is when Len is explaining that his company offers a life insurance policy which doesn’t pay for death due to automobile accident or airplane crashes, yet strangely it does have a double indemnity clause in the event the policyholder falls off a train. How did poor stupid stressed sleep-deprived Leonard Hoffman get into this mess? Len, insurance salesman, has 18-year-old triplets, all of whom were accepted to Yale (not Harvard like the furshlugginer Onion reviewer says) but none of whom got a scholarship. He’s sleepless and stressed because he can’t figure out how to afford the tuition. He asks the company owner Winslow (Robert Stack) for help, but the rich guy gives him a snotty, classist reply. A few hours later, Len arrives at a large mansion to sell a homeowner policy to Blanche (Beverly D’Angelo), wife to the terminally ill Steve. 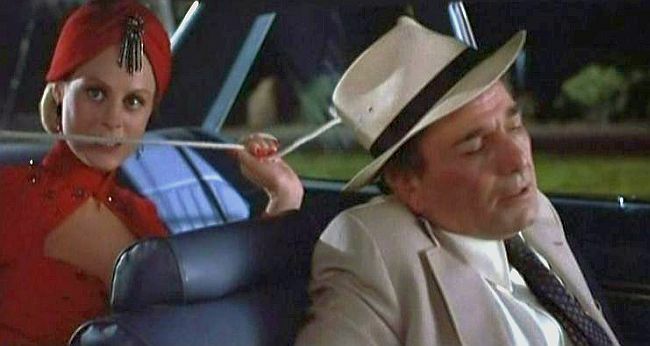 Blanche and Steve are absolutely nuts, by the way, but it’s difficult to tell because some really rotten editing makes its first appearance in the film in the scenes where Steve arrives home as Len is talking to Blanche. How did that bad editing even happen? Editor Ralph Winters did an excellent job on several fine films, as did Donn Cambern. Several somethings went wrong in the making of this movie, and one of those somethings was in the editing room, because what should have been a funny introduction to a clearly nutty guy was mostly incoherent and a touch racist. Blanche implies she wants a life insurance policy for her husband despite the fact that he’s terminally ill. Len balks at first, but later meets her at a drug store to talk in the aisles. Sound familiar? The plan to write the policy, kill Steve and split the money is hatched, and we spend several minutes watching to see just how they’re going to screw everything up, because there is no doubt that they will. After poor Steve is murdered and his body is placed to look like it fell off the train, Len goes home to watch the news, only to find that Steve’s body is now missing its face. The next day Len arrives at work only to be ushered into a meeting with Winslow, insurance investigator O’Mara (Charles Durning), Blanche and her attorney… who is Steve in the most ridiculously unconvincing bald cap ever. Things go from bad to worse and Len handles it all just as badly as you would expect an Alan Arkin character to handle it. 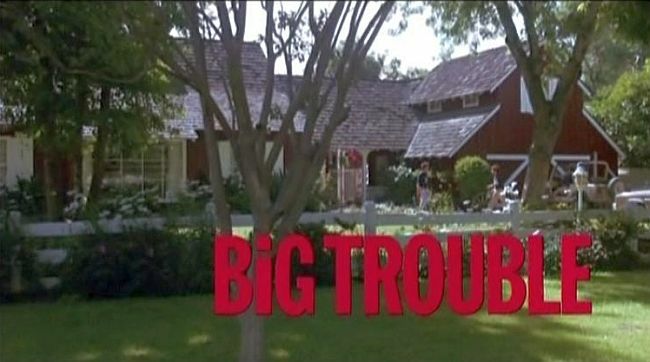 Big Trouble is better than its reputation claims, but with such a low-down nasty reputation, it would pretty much have to be Freddy Got Fingered to live up to the antihype it has accrued over the last 23 years. The film is unabashedly an attempt to cash in on the success of The In-Laws several years earlier, and this almost-sequel does borrow the overall context of the characters. 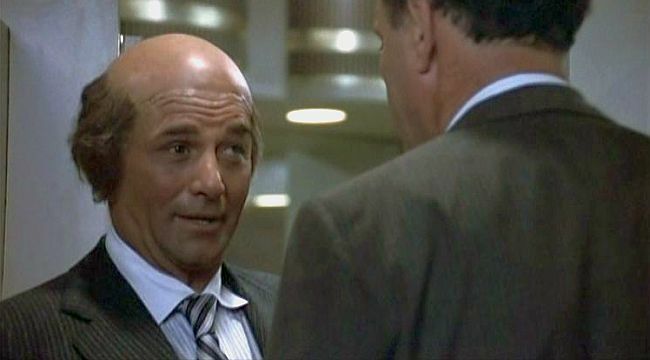 The biggest reason to see Big Trouble is to see Alan Arkin react to the crazy around him; at one point, he moos in distress. D’Angelo is great even though she’s in a role that doesn’t exactly stretch her range, and Falk puts in a solid performance as the maddening but sincere Steve. If we watch films like BT to see Arkin go fetal in panic, we also watch them to see Falk tell you with 100% conviction that the best way to solve a problem is to blow things up, abduct people, and lie to the cops. Direction was not the entire problem here, and I suspect that the fact that this was John Cassavetes’ last film often overshadows the real issues. There was a two-year delay in releasing the film which points to a serious problem within the studio itself, as does the fact that the author Andrew Bergman, who wrote The In-Laws (and Soapdish!) quit in the midst of production due to creative difficulties. BT uses the time-honored, crowd-pleasin’ tradition of showing the regular guy stick it to the rich and powerful, and I can’t help but think that Cassavetes, had he been in better health and in more control of the final product, would have turned that convention on its ear. That doesn’t mean the film should be judged entirely based on Cassavetes, though. BT is no more a Cassavetes film than it is an Alan Arkin film or a Peter Falk film. Films are a collaborative effort, and focusing entirely on the director is not always the best way to approach the analysis of a film. The studio had a hand in screwing up the film, as did the editors and sometimes even the actors, and it’s time reviewers stepped back and saw Big Trouble in its proper context rather than as a point of trivia in Cassavetes’ life. I’ve always felt, though, her range was so far beyond her complex, blonde sexuality (profoundly unique by definition) that she simply gave up without sufficient struggle. I feel sorry for, but leery of, anyone who has voluntarily failed to see the 1979 In-Laws, and if I were to meet such a person on the street, would immediately turn and run from them in a serpentine fashion.